I've decided to do a little retrospective of the past year for this week between Christmas and New Year's. It will give me (and you) a little break from headlines and the endless news reports. It will also give me time to rejuvenate my thoughts and inject new energy into my blog. I will be able to spend some time with my family and friends, but still give you something to think about. Each day I will list one, sometimes two, events that made an indelible impression on me; they will be in no particular order and feature incidents or people that made an impact on our culture, nation, or the world. As a photo can sometimes tell the heart of a story better than words, each day will feature an image and a short overview of what I think the significance of the story was. Feel free to offer your own comments, or suggest what stories made an impact on you. One thing for sure, 2012 will leave its mark on all of us! On June 22, 2012, former Penn State Assistant Coach Jerry Sandusky was found guilty on 45 of 48 counts of sexual abuse. 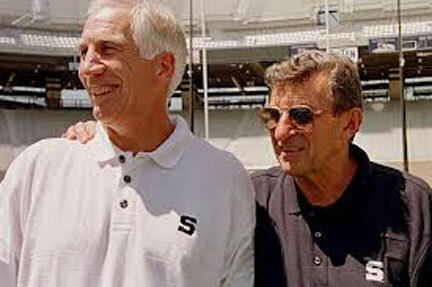 Sandusky was sentenced on October 9, 2012 to a minimum of 30 years and a maximum of 60 years in prison. This sordid trial left an ugly mark on college football. It uncovered the nasty truth that everyone wanted to deny .... in college football, money trumps all. School officials overlooked the obvious pedophilia being perpetrated against innocent young boys in favor of maintaining the college's reputation and alumni donations. In the end, it cost the college everything, including millions of dollars in fines by the NCAA and the Big Ten Conference. It also cost Joe Paterno his job, titles, and most likely his life, as the venerated coach died of what was very likely a broken heart. In the end, this is small consolation for the dozens of boys who were victimized by both Sandusky and the college system. It was a sad commentary on our culture; it pointed to greed and a lack of moral empathy towards the defenseless. All the fines and years in prison are not enough to return the innocence of those young boys. Psalm 72:4 "May He defend the afflicted among the people and save the children of the needy; may He crush the oppressor." Nature abhors a vacuum, and when there is no accountability for one's actions ( apparently this was the case, for a few even suggested they followed the law as far as it was required of them to pass information " up the chain " of authority ) then evil will move in. It was unfortunate for the students to have been required to pay the price, but VERY heartening to see the manner by which the football team this season showed their courage to endure ! I agree .... the student body and the football team have paid a heavy price for those who were supposed to be the leaders of this University. It's a good thing to see these kids step up and show the "right stuff" that was lacking in the administration.